Control health care costs with these cost-effective, technology-based prevention/intervention techniques! In 2001, Americans spent $1.4 trillion on health care services. By 2010, health care costs are forecasted to approach 20% of the United States' Gross National Product. Technology Applications in Prevention highlights much-needed technology-based prevention/intervention methods that can help contain health costs. "Efficient and Effective Uses of Technology in Community Research" provides the information that future prevention researchers and program evaluators will need to be effective in electronic data collection, management, and cost analysis. "Community Building with Technology: The Development of Collaborative Community Technology Initiatives" presents a case example showing how Web sites can function as regional clearinghouses of useful information and provide convenient forums where agency staff can update their prevention skills. "Applying Web-Based Survey Design Standards" addresses a question critical to professionals in e-data collection: How reliable is Web-based needs assessment and/or outcome data? This chapter suggests standards that should be adhered to in Internet-based data collection. "Assessing Quality Assurance of Self-Help Sites on the Internet" and "The Quality of Spanish Health Information Web Sites: An Emerging Disparity" address the current lack of quality in the health and mental health information available on the World Wide Web. "A Participatory Internet Initiative in an African-American Neighborhood" explores health disparity concerns regarding the use of the Internet. This chapter discusses several ways to empower those who are on the dark side of the "digital divide" and shows how to ensure that Web-based material is culturally relevant and appropriate for those it is intended to help. "Alcohol Abuse Prevention Among High-Risk Youth" presents a case example of a life-skills based CD-ROM intervention designed to discourage kids from abusing alcohol. "Constructing Better Futures Via Video" looks at video-based futures planning, which combines self-modeling and "feedforward" to forecast a student's future capabilities. This technique helps teenagers find meaning in their current educational setting and prepare for adulthood. This chapter also explains how to train school-based personnel to encourage positive attitudes and support the life skills of their students via carefully planned and edited yet inexpensive video productions. Why is the information in this book so essential? In 2000, approximately 20% of U.S. employers changed their health insurance plans as a cost savings strategy. American companies and their employees must new deal with new insurance plans that have reduced the breadth of their coverage and/or increased employee deductibles. The need for cost-effective preventive strategies is becoming increasingly more urgent as employers and insurance companies scramble to provide affordable health care coverage. New technologies have opened the door to better, more economical modes of preventive care. This book presents a vital cross-section of the current state of the art in the application of technology to prevention and intervention. Make it a part of your professional/teaching collection today! 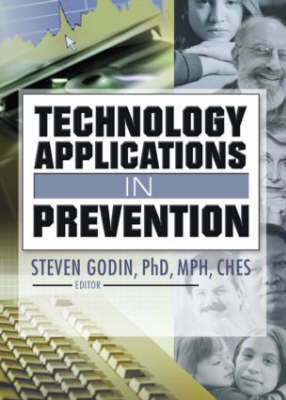 Buy Technology Applications in Prevention by Steven Godin from Australia's Online Independent Bookstore, Boomerang Books.